USAGE <br> <br> This typeface may be used by the licensee for any purpose not expressly denied below or by governing law. Using this typeface in a corporate identification or logo for any organization not directly affiliated with the licensee is a breach of this License Agreement (separate licenses for inclusion of the typeface in the logo of a non-licensed company or organization are available in exchange for royalty fees from Digital Graphic Labs). 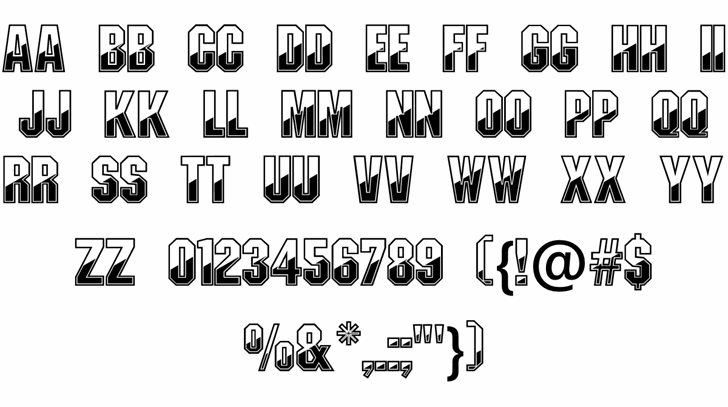 <br> <br>LICENSING <br> <br> This typeface is licensed for use by the licensee, and may be installed on multiple computer systems so long as care is taken to prevent unauthorized users accessing the typeface. Multiple user licenses are available, contact Digital Graphic Labs for details. <br> <br>DISTRIBUTION <br> <br> This full version of the typeface is not to be distributed, rented or leased. If you wish to distribute this product, contact Digital Graphic Labs for a trial version. <br> <br>TRANSFER <br> <br> Ownership of this typeface may be transferred to a different party, provided all software media, certificate of authenticity, documentation and related packaging are transferred and the original owner removes all affiliated computer files and files in which the typeface is used from any computer systems and offline storage systems. It is the responsibility of the new owner of the typeface to contact Digital Graphic Labs to report the transfer of ownership, failure to do so will result in invalidation of this license. <br> <br>REVERSE ENGINEERING <br> <br> This typeface remains the intellectual property of Digital Graphic Labs, and may not be reverse engineered or replicated. Offenders will be prosecuted to the full extent of the law. <br> <br>GENERAL <br> <br> If any provision or part of any provision of this Licensing Agreement shall be held invalid or unenforceable, such part shall be ineffective without in any way affecting the remaining parts of such provision or the remaining provisions of the Licensing Agreement. <br> <br>LIMITED WARRANTY <br> <br> This typeface is provided "as is" and without express or implied warranties of any kind including, but not limited to, implied warranties of merchantability or fitness for a particular purpose, all other such warranties are expressly disclaimed. In no event will Digital Graphic Labs be liable to the licensee or any other party for lost profits or other indirect, special, incidental or consequential damages, even if Digital Graphic Labs has been advised of the possibilities of such damages. Any liability on the part of Digital Graphic Labs will be limited exclusively to replacement of the typeface or refund of purchase price. <br> <br>REJECTION OF LICENSING AGREEMENT <br> <br> In the event that the licensee does not agree to conform to all provisions of this Licensing Agreement, the typeface should be returned to the place of purchase for a refund.